October 1 marked a new phase in the splintering of Quebec’s party system. The 2018 Quebec election is an important moment in Quebec’s Grand éclatement. In 2016, Marie Grégoire, Youri Rivest and I wrote about this great splintering in a book titled Le cœur des Québécois. It did not take place overnight. 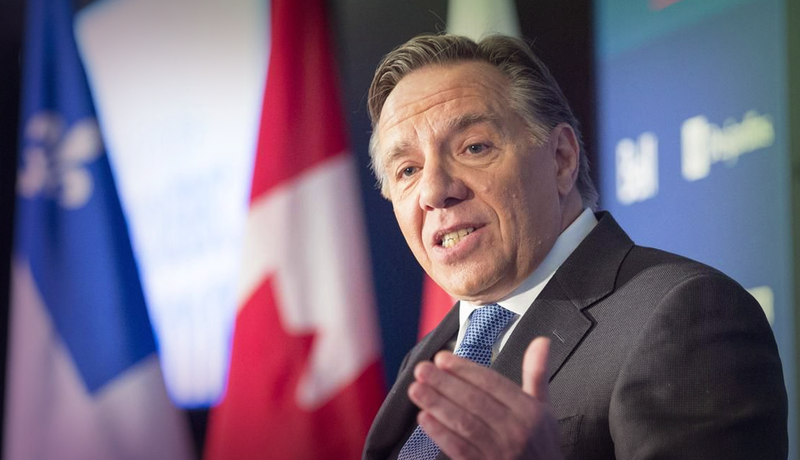 Underlying this change – which has now taken the form of a fragmentation and realignment of political forces, with the Coalition Avenir Québec (CAQ) replacing the Parti Québécois (PQ) – is a profound political transformation. For the first time since 1976, a new party forms the government. For the first time in almost 40 years, Quebec independence was not a central issue in an election campaign. The PQ chose to postpone the independence debate to 2022, leaving only Québec Solidaire (QS) to bring up the question while stressing environmental and socioeconomic transformation. The election thus accelerated the great splintering of the party system by turning the page on a cleavage that for two generations cemented the electorate behind the Quebec Liberal Party on one side and the PQ on the other. But even if Quebec society has become more diverse and more fragmented, the election also showed that most Quebeckers remains deeply attached to their common identity and culture. The CAQ was able to form a majority government, winning 74 seats with only 37 per cent of the vote, while the Liberals kept 31 seats with a historic low of 24 per cent. QS and the PQ battled for third place, with QS taking ten seats with 16 per cent of the vote, and the PQ also taking ten with 17 per cent. Of the 125 members of the National Assembly, 67 were elected for the first time. This made room for the election of 52 women among the record number of women candidates. Less noticed was how the Québec political parties have fully integrated the new technologies at the organizational level. The use of digital tools has had an impact on party strategies and changed the relationship between parties and their activists. The election of a new government from a political party that has existed for only seven years marks the end of an era.1 It has been suggested that this outcome can be explained by the outgoing Liberal government’s having been in power for almost 15 years, but deeper developments are involved. In this article I reflect on the underlying evolution of Quebec’s political dynamics, which set the stage for the new chapter that opened on October 1. The election was the first to be held in accordance with the law on fixed election dates, so everyone was prepared. Triggered a week earlier than planned by Premier Philippe Couillard, the election campaign lasted 39 rather than 33 days. It can be divided into three stages. Starting with a lead in the polls, the Coalition Avenir Québec clearly won the precampaign, being present in the field all summer long. To avoid the perception of a Liberal-CAQ duel at the beginning of the race, the PQ responded with an energetic campaign with numerous rallies, putting the CAQ on the defensive. The CAQ faced a slump in support and then an apparent shift in voting intentions after the first leaders’ debate. However, this changed ten days before the election, when CAQ leader François Legault and Manon Massé of QS were perceived as winners of the last debate. This resulted in a final trend: a fight for first place between CAQ and the Liberals while the PQ was relegated to fighting QS for third. As for diversity, here again QS and the CAQ stand out, with 10 per cent of candidates from visible minorities,5 nearly twice the proportion of Parti Québécois and Liberal candidates. Five elected CAQ members are immigrants, and the CAQ now has the most elected members from visible minorities in the National Assembly with four – elected in mostly francophone constituencies. Dr. Lionel Carmant, Haitian-born neurologist and Professor of Neuroscience and Pediatrics at Université de Montréal, was elected in Taillon, PQ founder René Lévesque’s former riding on the South Shore of Montreal. Nadine Girault is also of Haitian descent and won in Bertrand, 100 kilometres north of Montréal. Elected in Sainte-Rose, in the city of Laval northwest of Montreal, Christopher Skeete, whose father came from Trinidad and Tobago, is seen as a representative of the English-speaking community. Born in Morocco, Samuel Poulin was elected in Beauce-Sud, a rural riding, with nearly two thirds of the votes. In the wake of the changes observed in the United States and at the Canadian federal level, this was also the first Quebec election in which the electoral machines of the four main parties fully integrated digital tools and the analysis of big data into their campaigns. Increased use of new technologies by the political parties significantly changed party strategies and operations. This manifested itself in three ways. First, in terms of advertising, a significant part of their budget was moved to social networks. Concretely, right from their first election announcements, the parties focused as never before on specific segments of the electorate with targeted measures, notably the Liberals’ promise to provide separated parents with two health cards for their children and the Parti Québécois’s commitment in launching its campaign to offering lunch boxes to school-aged children. “Retail politics” has arrived, with political parties using sophisticated databases to mobilize their voters on election day. Note that these tools did not translate into an increase in overall electoral participation. Rather, they have led to a deemphasis of the role of party activists. Indeed, the parties with the most active members finished far behind in terms of votes cast. The PQ leader made his bed during his party’s leadership race in 2016. By putting la question nationale off to the 2022 vote, Jean-François Lisée confirmed that the issue would be removed from the 2018 election campaign. In doing so, he accelerated a phenomenon already well underway: the erosion of the Yes-No cleavage as a fundamental element in Quebec elections.6 It is worth looking more closely at the four long-term developments underlying the erosion: the fragmentation of partisan politics, the decline of support for pro-sovereignty groups, the political socialization of the new generations, and the end of polarization around the national question as the primary political cleavage . 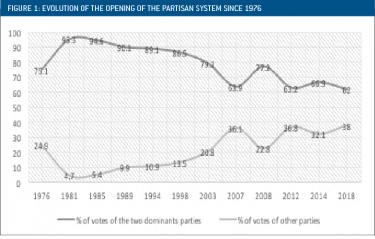 The Quebec party system has been changing since 2003, when a multiparty system emerged. Since then Quebec has had an open political system, one the dean of Quebec political scientists, Vincent Lemieux, characterized as a system in which the political parties that did not finish first or second can expect to win a total of more than 20 per cent of the vote.7 Figure 1 illustrates the fragmentation of the party system over time. It also allows us to visualize the decline of bipartisanship, in contrast with the period of alternation between the PQ and the Liberals from 1976 to 2003. Having finished third behind Action Démocratique du Québec in 2007, then fourth in 2018 (one seat behind QS), the PQ no longer occupies the status of a dominant party. A new chapter in Quebec’s politics now opens, in which the Yes-No duality will be no longer be at the heart of political debates in the coming years. This splintering is also reflected in the greater likelihood of minority governments. Quebec elected minority governments in 2007 and 2012 – before that there had been no minority government since 1878. Nevertheless, in 2018, this fragmentation made it possible to form a majority government with 37 per cent of the vote. The decline in support for independence since 1995 is also well documented. The work of Simon Langlois is revealing.8 He notes a steady decline in support for sovereignty among the population most likely to support independence, the francophone working class. Moreover, support for independence is even weaker among Generation Z voters (those born after 1995). 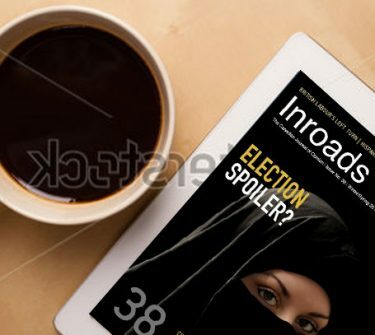 An Ipsos poll published in September 2018 for a symposium on youth and politics showed that only 19 per cent were in favour of independence.9 The aging of the indépendantistes is also confirmed by the results of the 2018 CBC Vote Compass.10 The Vote Compass also showed that despite QS’s sovereigntist position, its voters remain largely divided on the issue, and are typically drawn to it for other reasons. The decline of the Yes-No divide can be associated with the political socialization of new generations. Unlike their elders, who were mainly introduced to politics through debates on the national question, these new voters were politically socialized by new issues.11 This was particularly the case with the 2012 student crisis, which opposed much more than two visions of university funding. There were also two visions of the role and level of intervention of the Quebec state. On one side, the carrés rouges demanded free university education, and on the other, the carrés verts favoured increases in (comparatively low) tuition. In interpreting the data, the same Ipsos survey concluded, “While the upheavals of the debate on the constitutional future of Quebec have marked the political initiation of generations of Quebeckers, 18–25 year olds first cite the 2012 student crisis when they analyze their own political awakening.” Overall, it is clear that it is on the left-right, rather than sovereigntist-federalist, axis that much of generation Z was politically socialized. The decline in the Yes-No divide, however, does not mean that Quebeckers are less nationalistic than before when it comes to seeking greater autonomy for Quebec. Recent surveys show that more than 20 years after the 1995 referendum, this remains the political option most Quebeckers prefer.15 Looking at attitudes more closely, we observe a transformation of the foundations and elements on which Quebec nationalism is now based. The data from a CROP-L’Actualité survey published in 2016 illustrate this change well.16 Respondents associated successful integration of newcomers and the enhancement of Quebeckers’ international success with a more contemporary Quebec nationalism. In contrast, the conflict with an English-speaking elite and the holding of a referendum on independence were associated with the time of the first election of the PQ in 1976. On the party side, the Parti Québécois is clearly the main victim of the erosion of the Yes-No cleavage and the fragmentation of the party system. On its right, the Coalition Avenir Québec becomes the main vehicle of Quebec nationalism. On its left, the growth of Québec Solidaire undermines the traditional hegemonic role of the PQ on the issue of independence. As it celebrates the 50th anniversary of its founding in October 2018, the PQ faces an uphill battle to regain its status as a major party. This takes place in the context of a political reality in Quebec that is more complex than before. Fracture lines have multiplied. The end of the Yes-No cleavage leaves room for new divisions. It leaves the left-right axis on socioeconomic issues to structure the political debate, along with an emerging environmental cleavage. On the nationalism-cosmopolitanism axis, opposing political visions face each other, notably on the integration of newcomers and the language question. The linguistic divide remains important even though independence was put on hold. Though turnout was low among allophones and anglophones, they voted overwhelmingly for the Liberal Party, while francophones overwhelmingly rejected the Couillard government. By the end of the campaign, polls even ranked Couillard’s Liberals in fourth place among French-speaking voters. When the votes were counted, the Liberals had the worst results in their history. Will electoral reform change things? The transformation of a party system is not a frequent event. It implies a reconfiguration of political forces. It is also reflected in the emergence and decline of certain issues. That’s what happened in Quebec on October 1. The splintering was twofold. On the one hand, there has been a fragmentation of the francophone electorate, now represented via a multiparty system in the National Assembly. There has also been a fragmentation of the sovereigntist movement. The dominant position of the PQ is now contested by a new player on the left, Québec Solidaire, leaving the Coalition Avenir Québec as the main autonomist party in the National Assembly. Will this realignment of political forces be sustainable? Quebec has previously experienced two periods of transformation of its party system. The first occurred during the Depression of the 1930s, when the Conservative Party merged with Liberal dissidents to form the Union Nationale. The second materialized out of the Quiet Revolution: Liberal dissidents who had come together in the Mouvement Souveraineté-Association merged with the Ralliement National and most of the members of the Rassemblement pour l’Indépendance Nationale to form the Parti Québécois. This new party imposed the Yes-No cleavage on Quebec politics for more than a generation. Thus, it should not come as a surprise that the PQ has had to pay the price for the erosion of this cleavage. History may record 2018, like 1936 and 1976, as a realignment election. 1 The Coalition Avenir Québec was born in 2011 and merged with Action Démocratique du Québec, which had been founded in 1994. 5 Annabelle Blais, Philippe Langlois and Marie Christine Trottier, “Minorités visibles : les « anciens » partis traînent de la patte,” retrieved from https://www.journaldemontreal.com/actualite/minorite-visible. 6 See Eric Montigny, “La fin des Oui et des Non au Québec ? Un clivage en déclin,” Bulletin de l’idée fédérale, Vol.7, No. 1 (2016). 7 Vincent Lemieux, Les partis et leurs transformations (Quebec City: Presses de l’Université Laval , 2005). 8 Simon Langlois, “Évolution de l’appui à l’indépendance du Québec de 1995 à 2015,” in Amélie Binette and Patrick Taillon, eds., La démocratie référendaire dans les ensembles plurinationaux (Quebec City: Presses de l’Université Laval, 2018), pp. 55–84. 13 Marie Grégoire, Eric Montigny and Youri Rivest, Le cœur des Québécois (Quebec City: Presses de l’Université Laval, 2016), p. 86. 15 See Eric Montigny, “Un bilan de l’expérience référendaire québécoise,” in Binette and Taillon, eds., La démocratie référendaire, pp. 55–84.